Big Data technology, Machine learning techniques. Enabling Big Data technologies for for plastics process engineering. Process4Plastics (P4P) aims to build a dedicated methodology of process engineering for the production of plastics parts. In the industry 4.0 era, machines will be equipped with many sensors and actuators and be connected together to create intelligent networks. Heterogeneous sensors and actuators from multiple manufacturers are installed on the experimental platform of our partners. The provided cloud platform provides a central and standard way to communicate with them. 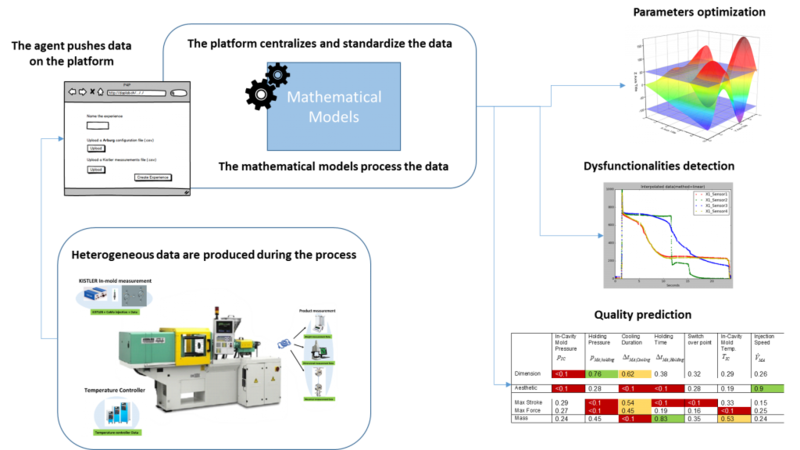 The analysis of the potential of data mining techniques in the injection molding process, coupled with machine learning techniques generate value from the information, like the discovery of correlations between phenomena to optimize the use and the placement of expensive in-mold sensors. By comparing past values and present values, processes or sensors dysfunctionalities can be detected as soon as they occur. Based on historical data, the trained mathematical models allow to predict the quality of molding outputs without running the whole process. The simulation can generate a robust enough prediction even if the set of parameters have never been experimented.